New Capital is a fiduciary to our clients. We focus on our clients' lives and goals and provide great value to them. We employ highly productive and trustworthy personnel and leverage information technology. We enjoy extremely high prospect conversion rates, client retention rates, and client satisfaction ratings. New Capital Management was founded in 2004 by Leonard M. Golub. As part of the rapidly growing independent fiduciary sector of the financial advisory business, New Capital has grown from one to four people, and from $50 million to approximately $300 million in assets under management, serving approximately 80 client households. Our service to you is built upon our service to our families, to our communities, to ourselves, and to each other. These are the right and strongest foundations, because they are built on people. We invite you to get to know us not only as advisors, but also as people. We believe that regulation of the securities industry is vital to preserving the confidence of investors and we take very seriously the requirement to comply with all federal and state regulations. New Capital’s primary regulator is the United States Securities & Exchange Commission, and the main law that regulates our company is the Investment Advisors Act of 1940. Under this law, we are among other things required to file and maintain publicly available information with the SEC, and to serve as a fiduciary to our clients, serving them with undivided loyalty. At the Securities and Exchange Commission's website, you will find data on New Capital Management LP on file as SEC registrant #131658. The major regulatory document for client reference is called Form ADV Part II. New Capital is required to provide this document annually to all clients. Another important requirement for registered investment advisors is to maintain an extensive set of operating policies and procedures. New Capital’s policies and procedures manual is updated annually, and all employees are required to attend meetings to review this document in depth. The fiduciary places the beneficiary’s interests first. The fiduciary prudently manages the beneficiary’s affairs. The fiduciary eliminates or discloses potential or real conflicts of interest. 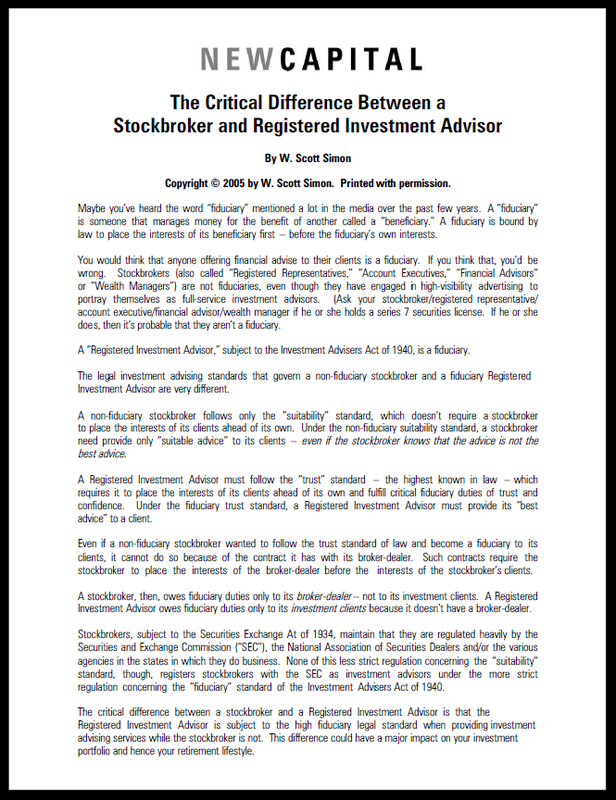 Investors everywhere are now learning of the importance of the fiduciary standard. From the beginning, New Capital has served as a fiduciary, and always will. New Capital personnel have achieved and maintain professional certifications and associations that are vital and highly trusted in the field of financial planning and investments. We also encourage our personnel to attain new certifications and help them pay for these efforts. Chartered Financial Analyst (CFA) represents investment capabilities in various areas including stocks, bonds, real estate, derivatives and options, and is viewed around the world as the most prestigious certification in the investment industry. 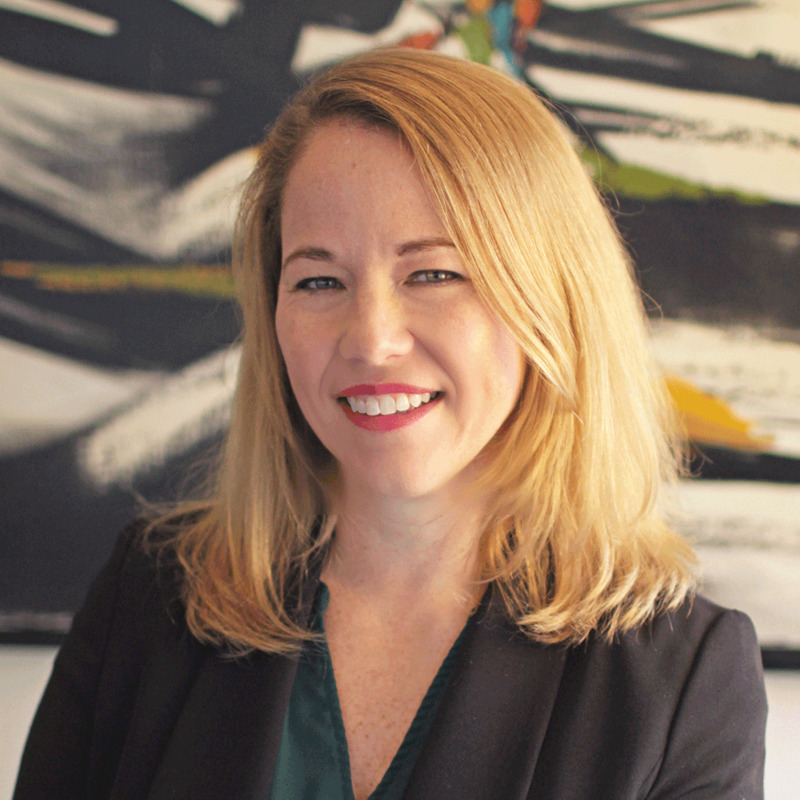 New Capital has two CFA charter holders on staff. Certified Financial Planner (CFP) represents capabilities in personal financial planning including investments, insurance, and estates. New Capital has one CFP in training on staff. Financial Therapy Association (FTA) - Financial therapy is a process informed by both therapeutic and financial competencies that helps people think, feel, and behave differently with money to improve overall well-being through evidence-based practices and interventions. Financial therapists help people reach their financial goals by addressing financial challenges and attending to the related emotional, psychological, behavioral, and relational hurdles that are intertwined. Leonard Golub became a member of the FTA in 2018. New Capital Management operates with a Code of Ethics that all personnel must sign, maintain a copy at their desk, and adhere to. At our firm, this code is read each year in its entirety and updated as needed. Additionally, professional certifications and associations, such as the CFA Institute, maintain their own Code of Ethics and Standards of Professional Behavior for their members. 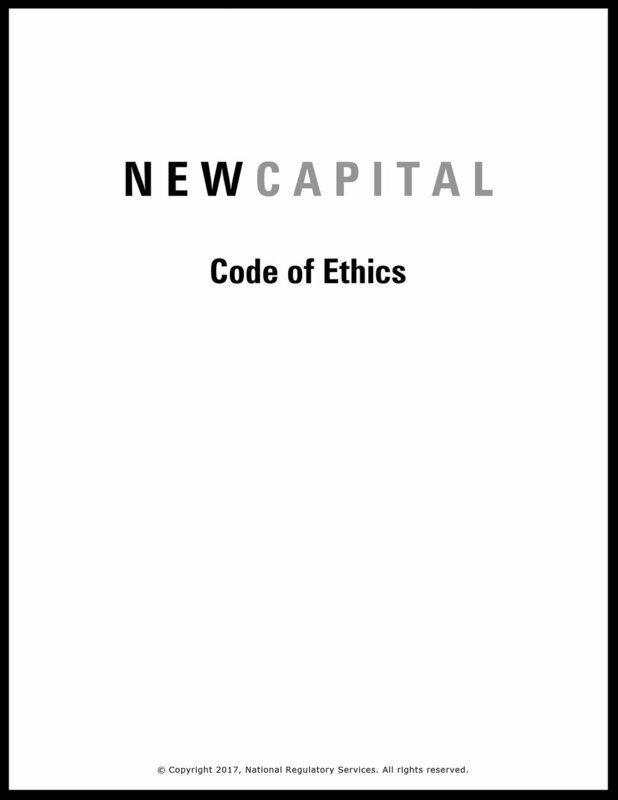 As a result, New Capital personnel may be subject to multiple Codes of Ethics. We believe that a Code of Ethics is not just a document, but an active code for governing and enforcing the consistent behavior of our personnel and for helping to assure our clients that we put their interests first. New Capital does not divulge our client roster to anyone, and we do not discuss that anyone has met with us. Our internal standards for confidentiality are as strict as those of an attorney, physician, or therapist. As a financial advisory firm, we recognize that we are increasingly in the business of both helping protect client data and helping clients protect their own data. We take both of these obligations with the utmost seriousness and attention. We help protect client data by maintaining strict internal data security policies, and by relying on third party information technology providers that demonstrate best practices. 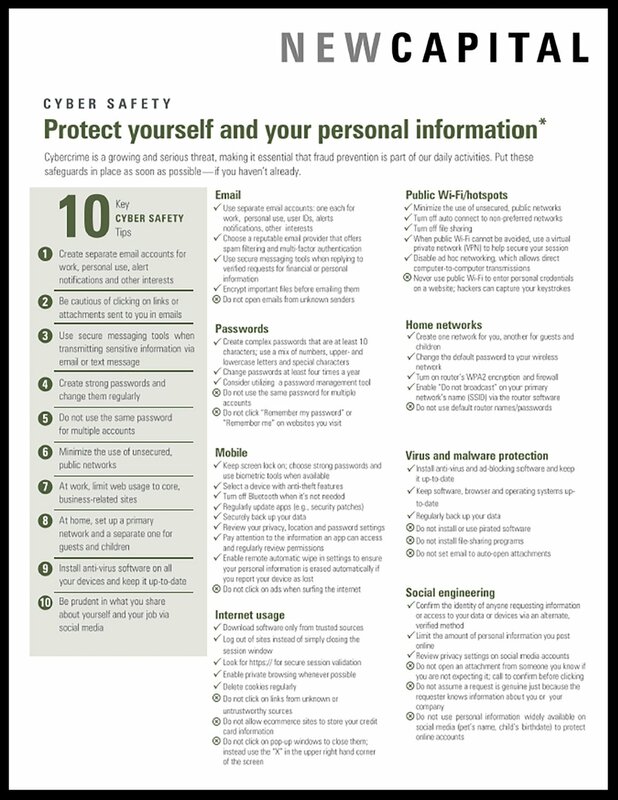 We help clients protect their own data by becoming technology “mentors” to our clients and assisting them in many aspects of their technology activities including password maintenance, virus and security maintenance, program maintenance, and more. We regularly assist clients who discover that they have been the victims of credit card fraud, email hacking, or password theft.